Earlier this month I found myself alongside three other women, standing round a stove watching an older, grey-haired woman stir something in a cauldron..sorry saucepan. I was on a day’s intensive workshop focusing on 15 medicinal herbs – how to grow them, identify them and process them to make simple remedies for everyday ailments. Exzema, high blood pressure, colds, catarrh, period pain, cuts and grazes, that kind of thing. I’d read in numerous books how to use plants for these ends but it all seemed daunting and complicated and so I’d never tried. There’s nothing like watching someone do something, and taking part yourself, for instilling confidence. Our herbalist teacher, Penny Ody, wants to empower people, and does so through her demystifying, generous and straightforward approach. (You can read more about her courses here). Standing around the stove in her Hampshire kitchen, we all participated in stirring, tasting, measuring and macerating the herbs. Delighted smiles broke over our faces as we realised how simple and doable most of it is. It occurred to me, as we dug up plant roots in her garden and stirred hot syrup, that we were taking part in something which has gone on for hundreds of years; an older woman showing younger ones how to work with herbs. I was there thanks to LILI, the low impact living initiative, an umbrella body for all kinds of fabulous workshops pointing the way to live more lightly on the planet. Through its website you can find workshops on all kinds of subjects, from hedgelaying to curtain-making courses. 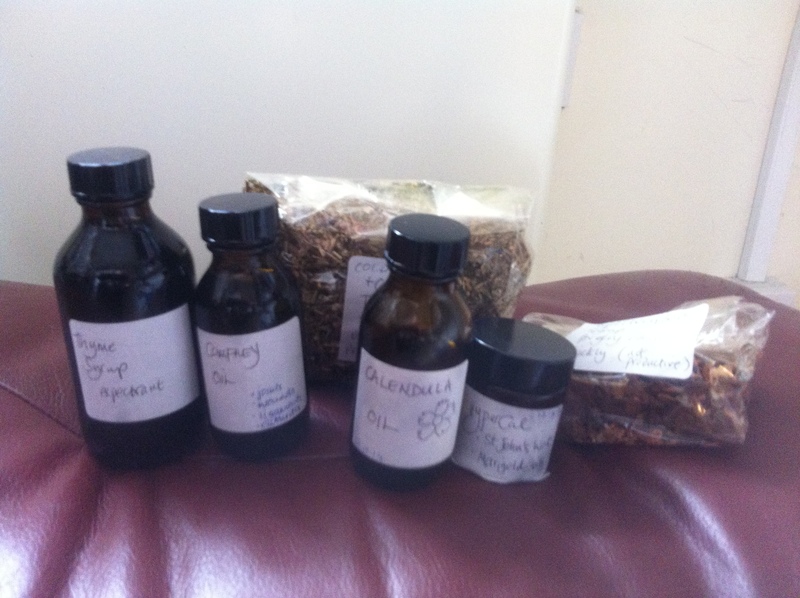 We left with many plant cuttings as well as five different herbal remedies for our home medicine kit – a therapeutic dried herbal tea blend, a macerated cold oil, a macerated hot oil, an ointment and cough syrup. More than that, we carried with us the knowledge of how to repeat the processes at home. Making basic herbal remedies like this is something – like all those other skills such as carpentry, sewing and food growing – that until recently, most of us knew how to do. For me, learning how to use plants to keep well and treat simple ills, is part of what the transition movement calls ‘the great reskilling’ – an important shift if communities are to survive and thrive within the unfolding ecological and economic situation. It’s about taking back some control, refusing to simply be a passive consumer, avoiding harming others in this economy of anonymity. Thanks to recent legislation requiring medicinal herbs to be licensed at a cost of £30,000 per year, many small independent suppliers have been put out of business and it’s likely that certain herbs will become commercially unavailable. So learning how to find, grow and process them oneself is now even more of an imperative. I won’t keep this knowledge to myself – I plan to share it during an upcoming herbal workshop I’ll be organising on a London city farm soon. And as I cook up my own remedies, I’ll be sure to post photos and descriptions here. This entry was posted in nature connection, resilience, Uncategorized and tagged herbal medicine, herbs. Bookmark the permalink.